"You have refused to join us. Do you know that Allah does not want us to have a kafir [infidel] neighbor? And you should know that Allah is about to send to you the Angel of Death in your house. Please prepare to meet him at any time." This may be Uganda, but Islam is Islam, and it is exactly what we see the Islamic State, Al Shabaab, Boko Haram, Hamas, etc. practicing. It's not just one "lone imam" or "lone mosque leader." Expect the attendant wails of "islamofauxbia" to shut down any criticism of this murderous ideology. Who speaks for the victims? Who gives voice to the voiceless? Uganda Mosque leader detained after issuing threat. Laurence Maiso's body was found at his house, his head in a pool of blood, on Jan. 27 at around 5 p.m. in Numuseru village, Naboa Sub-County in Budaka District. Four days earlier, Imam Kamulali Hussein had met him and his wife on a local road. According to Maiso's wife, the imam told him, "You have refused to join us. Do you know that Allah does not want us to have a kafir [infidel] neighbor? And you should know that Allah is about to send to you the Angel of Death in your house. Please prepare to meet him at any time." Hussein departed. Four days later, Maiso's wife went to see a friend in nearby Lupada village. She returned to find her husband dead on the floor. Her cries brought several neighbors to the house. Police rushed to the site, and the next day they arrested Hussein, well-known in the area and dubbed "the malaria of Christianity," at Nampangalle village. The case is registered at Naboa police post with a reference number of CRB Ref: 28/2016. "We found the villagers at the scene of the incident, and immediately we removed the body from the house and took it to the police station, then to the mortuary in Budaka," said a police officer who requested his name be withheld. "The following day we carried out an intensive search, and from a lead from a villager we managed to arrest Hussein at Nampangalle village. We took him to Chief Magistrate Three at Kalaki court, and he was later remanded to Kamuge prison in Palissa District." A neighbor told Morning Star News that on the day of the murder, Jan. 27, she saw eight men coming out of Maiso's house at 4 p.m., including Hussein, and that some of them were dressed in traditional Islamic attire. Another neighbor said he spotted Hussein's uncle and other Muslims in the area around the same time. 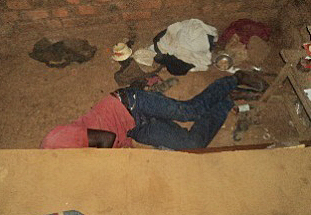 One of the assailants, Mudangha Kasimu, threw a stone that hit Kuloba in the forehead. Kasimu then shot him twice in the head, and he died as other Muslims were shouting, 'Allah Akbar [God is greater],'" sources said. An area source said a 14-year-old boy from Kabuna, Karami Hassan, was with Badir's three children when they were abducted near their home. The boy said a group of Muslims from Palissa were looking for Badir, and the boy led them to Badir's children. Her husband's brother, Samson Nfunyeku, was killed in the village on Sept. 23 after flaring tempers cut short a religious debate he'd had with Islamic scholars. Previous Suicide Epidemic: Why Does The Number Of People Killing Themselves Just Keep Going Up?